James Cohan Gallery is pleased to introduce Simon Evans, a London-born artist, who exhibitionsly lives and works in Berlin. 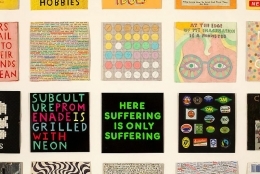 Former pro-skateboarder and writer, Evans found his voice as a visual artist and has been exhibiting his work since 2003. This is the artist's New York gallery debut show. Simon Evan's delicate text-based works are collaged and assembled from prosaic materials including found paper, scotch tape, pencil shavings, colored pencil and white out. They describe a world poised between two poles of earnestness and irony. 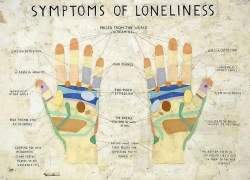 With his anxieties laid bare and his wry brand of melancholy, Evans presents us with a veritable laundry list of drawings that take the form of diagrams, charts, maps, lexicons, diary entries, inventories, cosmologies and epistolary entreaties that plunge the viewer into alternate states of pathos and hope. 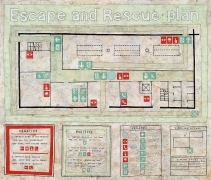 The exhibition Island Time will be installed over two galleries with titles such as Escape and Rescue Plan and Everything I Have that point to inspiration taken from both the mundane and personal. The title of the show Island Time is a reference to Robinson Crusoe and the hand-made objects that were critical to his survival on a desert island—a metaphor that draws connections between the state of being shipwrecked, to the role of the artist as an outsider, to the artist's personal biography living as an expatriate in a foreign city. Evident in the work is Evan's preoccupation with counting and charting—an activity also key to survival as a castaway. 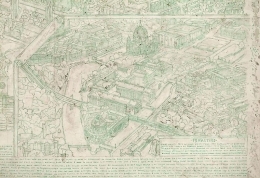 In the main gallery, the drawing Green City presents an exact copy of a tourist map of Berlin redrawn in green ball point pen and white out. Evans says that, "Tracing things is a way of making something mine in a world which feels already filled with too much." 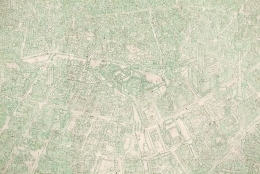 He goes on to describe the significance of the color green in this exploration as a reference to naiveté and a utopia unspoiled by experience while at the same time making an allusion to the flip-side which is Berlin's darker history. 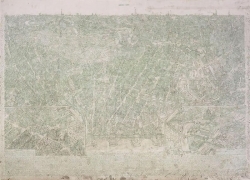 Green also marks the season in which the drawing was made—it took an entire summer in a very green Berlin to trace this map. 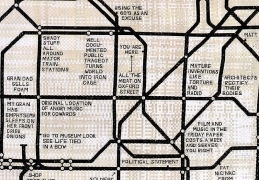 The companion piece Home Country is a map of the London Tube made of woven paper. 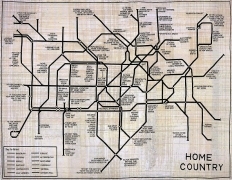 This depiction of the artist's hometown, with all of the Tube lines drawn in black, communicates a web of ideas and reflections about the notion of homeland. 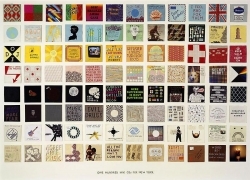 Other works in the show will include One Hundred Mix CDs for New York which is a collection of mix CD's that are arranged together in one frame. 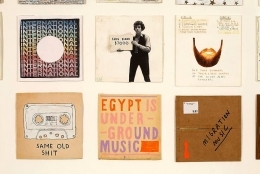 In this sprawling work, Evans attempts to encapsulate his feelings about art and music, in particular regarding the gesture of exchange that typifies the making of mixed CD's. Evans exhibitionsly lives and works in Berlin. His work was the subject of solo exhibitions in 2005 at the Aspen Art Museum (Aspen, CO) and White Columns (New York, NY.) He has participated in the 2006 Sao Paolo Biennial (Sao Paolo, Brazil) and 2004 California Biennial (Orange County Museum, Newport Beach, CA.) 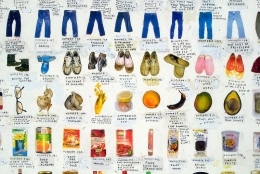 Evans' work has been included in international group exhibitions most recently at the Fotomuseum Winterthur (Winterthur, Switzerland); the Tate Modern (London, UK); the Mori Art Museum (Tokyo, Japan); and the Frankfurter Kunstverein (Frankfurt, Germany). More information on the artist is available at his artist page on www.jamescohan.com .